I realised I haven't done one of these posts for ages (over a year I think!!!) - which is odd since I am constantly swooning over new covers. I LOVE this cover! Yes I did kind of imagine Isaiah slightly differently (more tattoos and just kind of more bad boy - I'd cross the street if I saw you hotness) but he's still pretty close to how I would picture him. And I love the colours, them in the car, I love the way the title goes down the side - the quote just above the authors name. It makes them the focus and I love that. I must say, I have really liked all of Katie McGarry's covers - they have a Perfect Chemistry/Simone Elkeles vibe but at the same time scream Katie McGarry. I would look at that cover and just think of her books - do you know what I mean? Anyway, not only do I love the cover but I CAN'T WAIT to read it. Isaiah became one of my favourite characters after reading Pushing The Limits and Dare You To so I am seriously looking forward to his story. 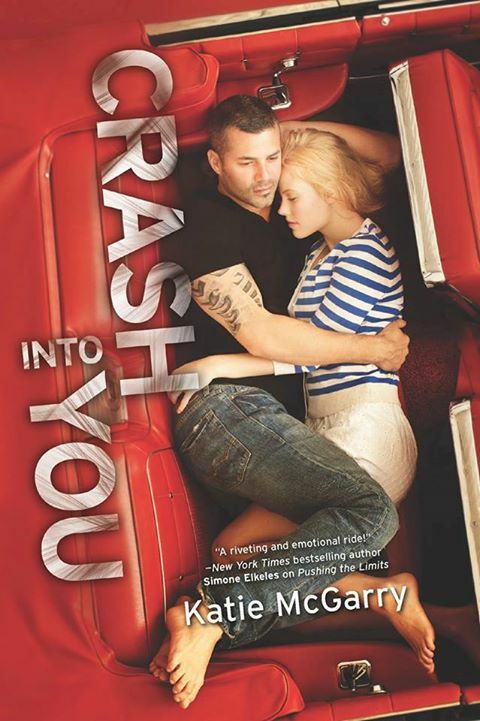 Crash Into You is published November 2013 (US) I haven't be able to find a UK release date yet. I love this cover too and cannot wait for its release-Isaiah's story sounds so promising! Too excited about this book!!!! !